Sorry, I am not a frequent visitor of the forum, but whenever I feel the need to give you an update, I will do so. A young woman (45), married, mother of 2 children (19 and 15) came to me 2 years ago for pain treatment in her arm. So, no big deal I supposed. But pain persisted… She placed her arm in a cotton support to prevent overload of movement. Testing with Bioresonance gave no conclusive results. Suddenly she was brought to the hospital because she broke her upperarm bone. A scan showed that her arm bone was reduced to pencil thin. So they operated her and replaced her lost bone with a long pin. Blood tests showed a severe case of Multiple Myeloma. I never had heard of this disease before. In my Hunter archive I found test results of elevated gamma-globulins and globulin-g, but I was not aware of the meaning. So Bioresonance actually did find the diagnosis earlier, but I did not know what it meant. She got a chemo treatment with pills, Revlimid. It brought down her quality of life, but for the sake of her family she bravely continued the treatment. They suggested also to perform a stemcell therapy, but she refused. After one year of treatment her oncologist agreed with her to give her a break of 3 months to recover and than continue again. That was the moment that I saw her again. I started to treat her weekly with Spooky Plasma with the frequencies in the database of Multiple Myeloma, gating set at 3.6 Hz. (3.6 is a Tesla number) She saved her last pill of Revlimid for me. So I used also her last pill of Revlimid for treatment with my Bicom. 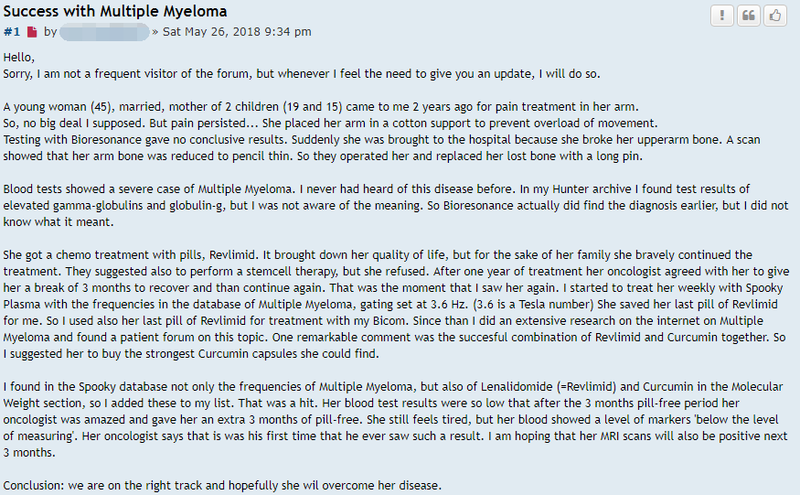 Since than I did an extensive research on the internet on Multiple Myeloma and found a patient forum on this topic. One remarkable comment was the succesful combination of Revlimid and Curcumin together. So I suggested her to buy the strongest Curcumin capsules she could find. I found in the Spooky database not only the frequencies of Multiple Myeloma, but also of Lenalidomide (=Revlimid) and Curcumin in the Molecular Weight section, so I added these to my list. That was a hit. Her blood test results were so low that after the 3 months pill-free period her oncologist was amazed and gave her an extra 3 months of pill-free. She still feels tired, but her blood showed a level of markers ‘below the level of measuring’. Her oncologist says that is was his first time that he ever saw such a result. I am hoping that her MRI scans will also be positive next 3 months. Conclusion: we are on the right track and hopefully she wil overcome her disease.